Download "1. What is the difference between nominal returns and real returns?" 2 NOI is the annual return on the property prior to financing, also known as the unlevered return. To get the cash flow, debt service is subtracted from NOI to pay for any mortgage financing where the debt service includes both principal and interest owed. If there is no financing there is no debt service and the NOI is same as cash flow. 6. Why is it difficult to measure total returns on direct real estate investments? 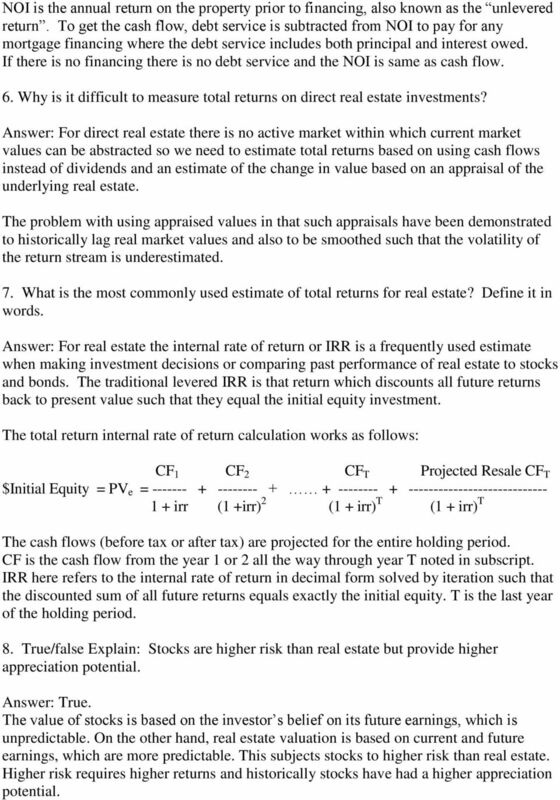 Answer: For direct real estate there is no active market within which current market values can be abstracted so we need to estimate total returns based on using cash flows instead of dividends and an estimate of the change in value based on an appraisal of the underlying real estate. The problem with using appraised values in that such appraisals have been demonstrated to historically lag real market values and also to be smoothed such that the volatility of the return stream is underestimated. 7. What is the most commonly used estimate of total returns for real estate? Define it in words. Answer: For real estate the internal rate of return or IRR is a frequently used estimate when making investment decisions or comparing past performance of real estate to stocks and bonds. The traditional levered IRR is that return which discounts all future returns back to present value such that they equal the initial equity investment. The total return internal rate of return calculation works as follows: CF 1 CF 2 CF T Projected Resale CF T $Initial Equity = PV e = irr (1 +irr) 2 (1 + irr) T (1 + irr) T The cash flows (before tax or after tax) are projected for the entire holding period. CF is the cash flow from the year 1 or 2 all the way through year T noted in subscript. IRR here refers to the internal rate of return in decimal form solved by iteration such that the discounted sum of all future returns equals exactly the initial equity. T is the last year of the holding period. 8. True/false Explain: Stocks are higher risk than real estate but provide higher appreciation potential. Answer: True. The value of stocks is based on the investor s belief on its future earnings, which is unpredictable. On the other hand, real estate valuation is based on current and future earnings, which are more predictable. 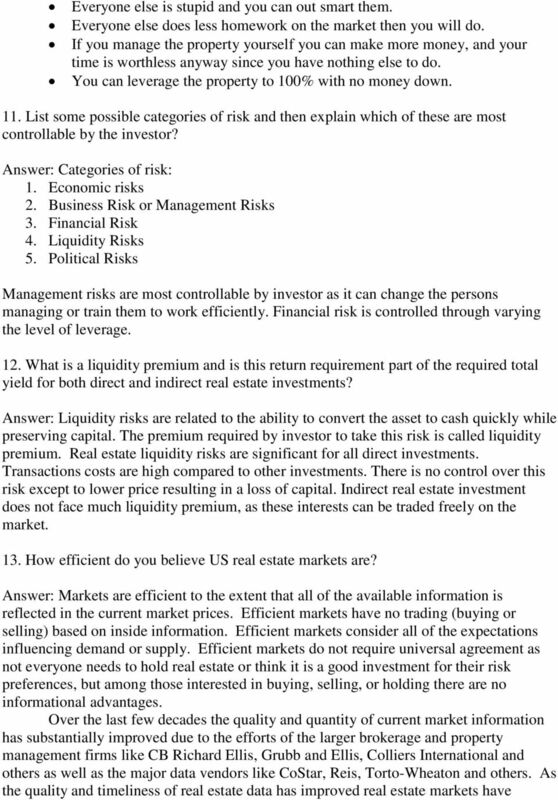 This subjects stocks to higher risk than real estate. Higher risk requires higher returns and historically stocks have had a higher appreciation potential. 3 9. Compare the cash flow returns likely on real estate, growth stocks and bonds. Answer: The following tables gives the comparison: Source of Return Bonds Stocks Direct Real Estate Current return Coupon usually paid twice a year. Tax sheltered return 1 Future return Total returns None unless municipal bond. Difference between par value when redeemed, usually $1,000, if this exceeds current market value at the time of maturity or before through a sale if the market value goes up because of declines in required yields. Yield to maturity considering the initial price, coupon and known terminal value. Dividends paid periodically, over market price, known as the current return. None. Price changes over time net of transactions cost. Dividends plus price change in a given year indicate total return for that year. Dividends and expected price changes over time will produce an uncertain estimate of an annualized yield to maturity. Cash flow from rents less expenses and debt servicing if any. Taxable income may be less than cash flow providing some tax benefits. Appreciation in value net of transactions costs, if any, plus equity buildup through debt principal repayment, if any. Cash flow after tax, if relevant, and net equity expected at the time of sale produce an overall estimate of the annualized yield known as the internal rate of return 10. How do the get rich in real estate seminars typically provide above market returns? What are the typical assumptions they make to convince the naïve investor? 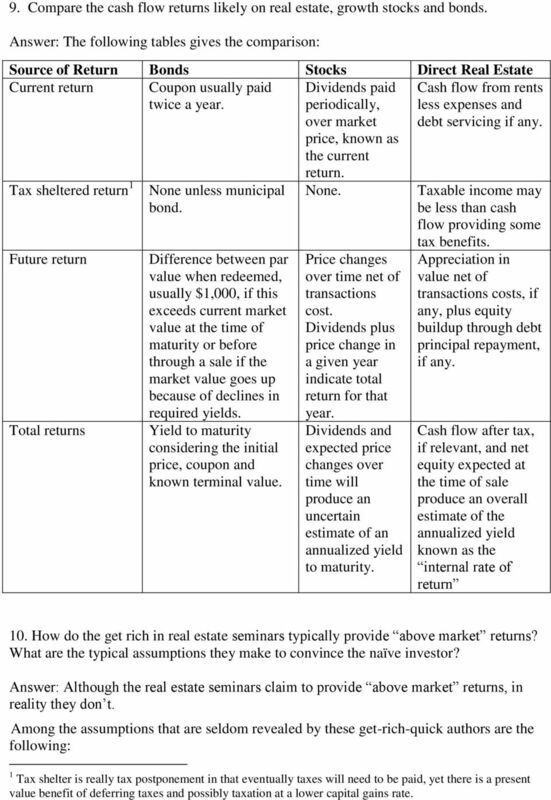 Answer: Although the real estate seminars claim to provide above market returns, in reality they don t. Among the assumptions that are seldom revealed by these get-rich-quick authors are the following: 1 Tax shelter is really tax postponement in that eventually taxes will need to be paid, yet there is a present value benefit of deferring taxes and possibly taxation at a lower capital gains rate. 5 become more efficient, especially among the larger assets of $10 million and up where sophisticated institutional investors dominate the market. 14. Name one advantage of using a partnership for a single real estate investment. Answer: By structuring partnership contracts a single real estate investment can cater to different investor requirements, hence partnerships are formed to benefit from this discretionary allocation mechanism. For example: one investor may want current returns and another may want future wealth. By structuring an investment with various contractual interests (securities or mortgages) that direct the return priorities to different investors multiple investors can achieve their objectives. Long-Term Debt. Objectives: simple present value calculations. Understand the terminology of long-term debt Par value Discount vs. Objectives: Long-Term Debt! Extend our understanding of valuation methods beyond simple present value calculations. Understand the terminology of long-term debt Par value Discount vs. Premium Mortgages! 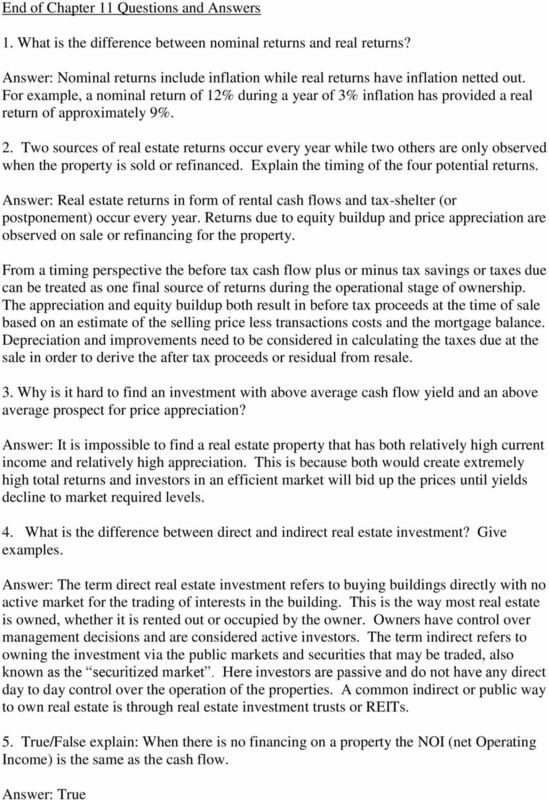 CHAPTER 8 STOCK VALUATION Answers to Concepts Review and Critical Thinking Questions 5. The common stock probably has a higher price because the dividend can grow, whereas it is fixed on the preferred. 1. If the opportunity cost of capital is 14 percent, what is the net present value of the factory?